1.) 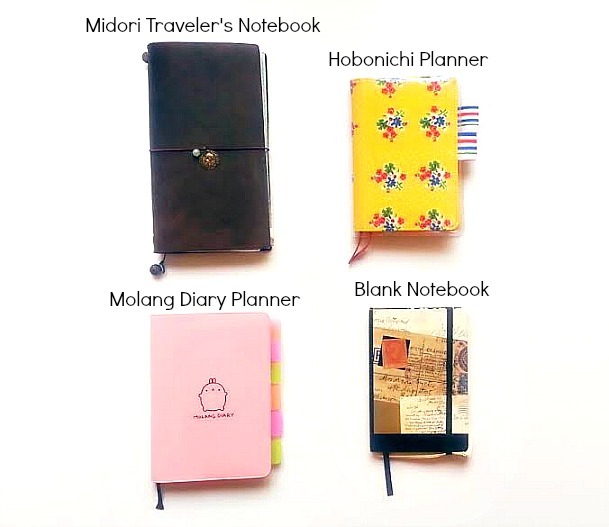 Midori Traveler's Notebook- When I originally purchased this, I used it more as a creative art journal. I drew in there, I scribbled thoughts, glued pictures of inspiration, and pretty much added random things that didn't fit in the other 3 journals pictured. But as the months passed, I really wanted to use it more for traveling and life adventures. So now I just use it whenever I go on road trips with friends, hiking in the mountains, and any type of exploring. Moving forward, this will also be used to document activities and memories throughout future travels I plan on doing. I purchased mine at a Japanese bookstore in New York, but there are a few online stores that carry them : Baum-Kuchen, Resor Shop, and Goulet Pens. For those that love the leather appeal of the notebook, but looking for other alternatives, Etsy is a good place to find those handmade covers. 4.) Little blank notebook- This is my little black notebook that I carry around with me everyday. It's used to write down those "ah ha!" moments, inspirational quotes, books that people recommend, ideas that pop out of nowhere, and last minute changes on plans or get-togethers. I purchased mine at Marshalls, but the brand is called Eccolo. Now I know some may think that having more than 1 or 2 notebooks at a time is overwhelming, but it really works for me. In my opinion, I think it's more overwhelming to have just one notebook for all the things I've listed above. I would get lost in my own writing and get confused on where I wrote "this" or what day I needed to do "that." So with having a separate notebook for all the different things in my life, it helps me stay focused and organized. I see them more as subject dividers, each notebook serves it's purpose in providing me the separation I need for the different events in my life. You should get one! They're very compact and easy to carry around for everyday writing. I have just tree notebooks so You are the best! Cute journals! I need a notebook like #4. I keep saying I'll put one in my bag, but then I keep forgetting. I have wondered what you used them all for! This is very interesting. I like how you refer to them as "subject dividers." My entire life, no matter what my original purpose for a certain notebook was, it always ended up being a journal. It's like I can't manage to keep my thoughts separate from everything else. I like your system, though. I didn't even know what a hobonochi was until Instagram. I like the concept behind it. Great post! Thank you, Amber! My thoughts can get so scattered sometimes, so I need the separation to help maintain them all or else I'll go crazy. It's nice to know other creative individuals' processes and ways. It's a very personal and dear, as I appreciate sharing my own ways as much as learning others. Great post. 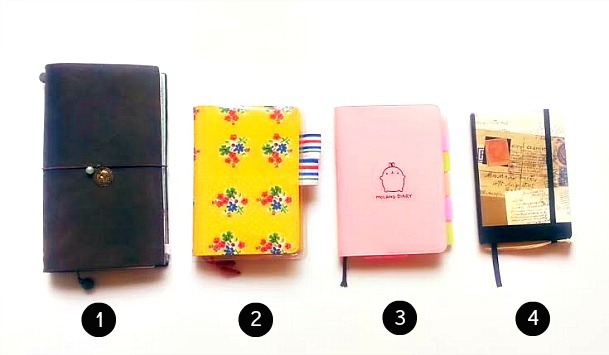 You just NEED more than one notebook when you are creative!